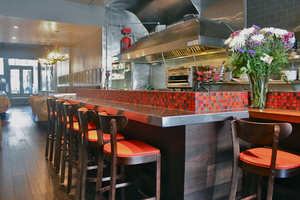 The counter and open kitchen. Photo: Dana Massey-Todd. © tablehopper.com. 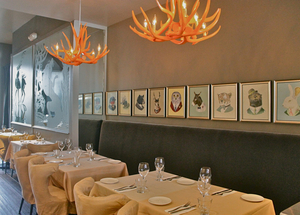 Fable’s mohair banquette, plus animal portraits. Photo: Dana Massey-Todd. © tablehopper.com. Seating under the mirrored walls. Photo: Dana Massey-Todd. © tablehopper.com. Last night was the pre-opening party for ~FABLE~ in the Castro. The restaurant should be soft opening for business at the end of the week (TBD), and will be officially open next Tuesday. The design by Craige Walters is whimsical and colorful, bringing the “fable” theme to life. When you first walk in, there’s an open kitchen with counter seating, a backsplash of colorful mosaic tiles, and wood and persimmon tall chairs (with backs on them, how comfortable). Extend past the kitchen and there’s a seating area with slipcover chairs and a mohair banquette in gray, with orange antler lights above. 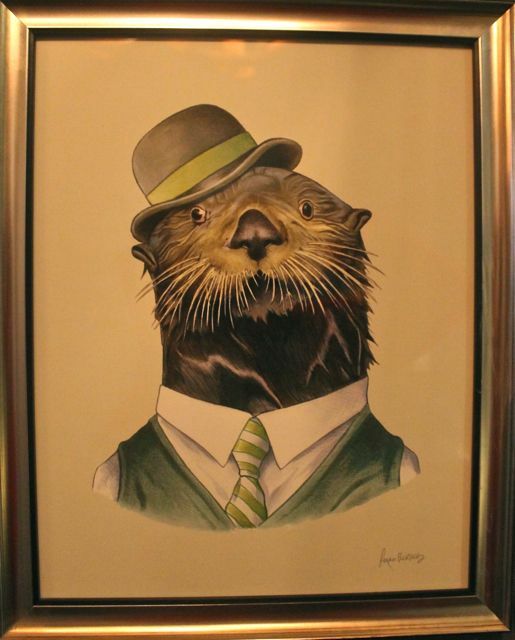 Above are some quirky animal portraits by Ryan Berkley (wait until you see the squirrels in the restroom). FYI, larger parties of six will be able to reserve this seating area. 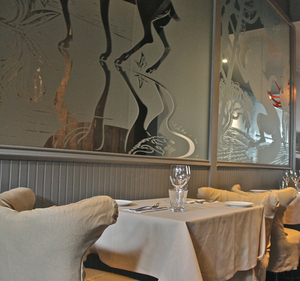 The walls in the back seating area feature some large-format decals of characters from Aesop’s Fables on top of the mirrored surfaces and a custom one was made for the wall (there’s also some wallpaper that looks like reclaimed wood, I chuckled). Overall, it has a nice neighborhood vibe with just enough style and clever touches. There are 32 seats in all. The back garden area is still in development—it will eventually have a garden, a lounge area, and seating for about 25-30 people. There will be a semi-enclosed patio, a dedicated back bar, and will be open for tapas and bubbles in the afternoon, hopefully by the summer. Here’s the first look at chef-owner Jon Hearnsberger’s New American menu, which features a variety of salads (including baby beets and goat cheese in parchment), and entrées like pot roast, shepherd’s pie, and duck breast (in a wallet-friendly move, none of the main dishes cost more than $20). On tap are four beers (including Speakeasy Prohibition and Lagunitas), and Pamela Busch (Skrewcap) put together the small but diverse wine list that spans both domestic and international wines by the glass. There are some more esoteric selections, but each wine is well balanced and has its own personality. The goal is to bring in the best tasting wines at reasonable prices. For now, hours will be nightly 5pm-10pm, and happy hour (3pm-5pm) and brunch (served Fri-Sun) will be coming soon. 558 Castro St. at 19th St., 415-590-2404.